Westobri Kennels is a small family run hobby kennel. We have had a long association with gundogs commencing in the early 70’s when Terry and Jill met Westy Morris of Ruvalan GSP’s in Victoria. 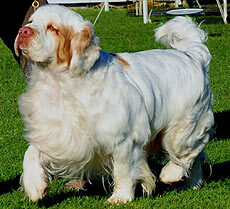 Two GSPs were purchased from Westy and then began a lifelong interest in Gundogs. Westobri GSPs were shown successfully and worked in Retrieving Trials and Field Trials in the NT and South Australia. Terry was a well-respected Retrieving Trial judge until his ill health and death in 2005. Jill continued the kennel and pursued her interest in clumbers A love of clumbers had emerged after following them in Australia and seeing them first hand in the UK, Sweden, Europe and the USA. A handsome young clumber - Erinveine Zou, now Aust Grand Champion Erinveine Zou (Hips 0:0 ED 0;0), came from Jan Irving of Erinveine Clumbers. Then came Aust Ch Erinveine Unanimous (Annie). The beautiful Lily - Aust Ch Cactus Snow Catch A Wave - was imported from Sweden with the support of Jan and Valana Wells - USA. Our first homebred litter with Zou and Lily was born in 2010. There were 3 quality progeny born all who have gained their championship tiles and excelled in the show ring. In February and March 2013 two clumber litters were born at Westobri combining the best of Australian, Swedish and Dutch bloodlines.